BRAMPTON, ON, Feb. 12, 2019 /CNW/ - One of Canada's most recognized brands is now available as one of Canada's most beloved beverages. In keeping with its 40-year philosophy of simplicity and quality, mixed with a hint of humour, the team behind no name® is launching beer. 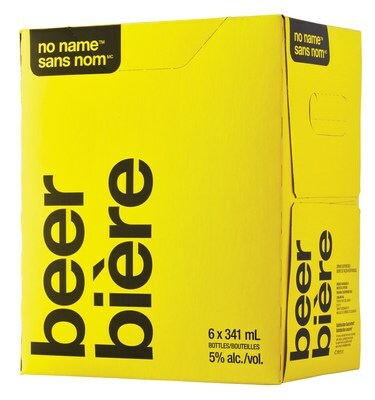 The no name™ beer is a characteristically Canadian-style lager proudly brewed here in Ontario, packaged in the bright yellow-and-black format that Canadians have grown to love. "Our no name® brand was built on a promise of simple products at outstanding value. This is what we're bringing to beer drinkers who are looking for a quality beer, without all the lifestyle frills," says Ian Gordon, Senior Vice President, no name. "The new no name™ beer will stand out with its recognizable yellow label, and one word: Beer. It's a beacon for customers looking for a great taste at an unbeatable price." This new no name™ beer will retail for $10.45 for a six-pack and will be arriving at select LCBO stores and online at lcbo.com this February. To kick-off its arrival, and to celebrate the first long weekend of 2019, it will be part of the 'buck-a-beer' program and available for $6.60 (including deposit) from February 15 until February 17, 2019, or while supplies last. "When we piloted 'buck-a-beer' to Ontarians last fall, the results were unbelievable," said Gordon. "We had record-breaking sales and incredible consumer feedback. It was an easy decision to bring the no name® brand to this category at this price." This is the first of a series of weekends that this promotion will be running throughout the year. Loblaw Companies Limited is the nation's largest retailer, providing Canadians with grocery, pharmacy, health and beauty, apparel, general merchandise, financial services, and wireless mobile products and services. Loblaw's purpose – Live Life Well – promotes the needs and wellbeing of Canadians, who make one billion transactions annually in the company's stores. With more than 2,400 corporate, franchised and associate-owned locations, Loblaw, its franchisees, and associate-owners employ almost 200,000 full- and part-time employees, making it one of Canada's largest private sector employers. 03/12 LOBLAW : to Participate at the 2019 Desjardins Industrials, TMT & Consumer Confe..